Live on BBC TV, HD, Red Button, Radio 5 live, 5 live sports extra, online, mobile, the BBC Sport app and Connected TV. Defending champion Andy Murray will open play on Centre Court against Belgian David Goffin as Wimbledon gets under way on Monday. Murray, 27, became Britain's first male singles champion since 1936 last year, and he will return to the scene of his triumph at 13:00 BST. "I don't know how I'm going to handle the situation; no-one does," Murray told BBC Sport. "It will be interesting for me to see how I deal with it." Top seed Novak Djokovic of Serbia and China's Australian Open champion Li Na are also in action on day one, along with six other Britons. Li, the second seed, will play Poland's Paula Kania in the second match on Centre Court, before Djokovic, last year's runner-up, takes on Andrey Golubev of Kazakhstan. Two-time Australian Open winner Victoria Azarenka, Queen's Club champion Grigor Dimitrov and former Wimbledon semi-finalist Jo-Wilfried Tsonga are the leading names in action on Court One. All eyes will be on Centre Court, however, when Murray fulfils the tradition of all returning champions by getting play up and running in the famous arena. The queue for show-court tickets began forming on Saturday, and at 08:30 BST on Sunday tournament officials announced that there were already more people in line than the 1,000 seats available. Interest is predictably high as Murray prepares to become the first British man to return to the All England Club as champion since 1936, with Fred Perry - who also won at Wimbledon in 1934 and 1935 - missing out on defending his title in 1937 after turning professional. "Firstly my mind will be focused on the match - getting ready for it, getting the tactics right - but the walk to the court will be different," said Murray, who will play Goffin for the first time. "I would expect to feel pride but also pressure and some nerves as well. I'm looking forward to it - it's something I've never experienced before." 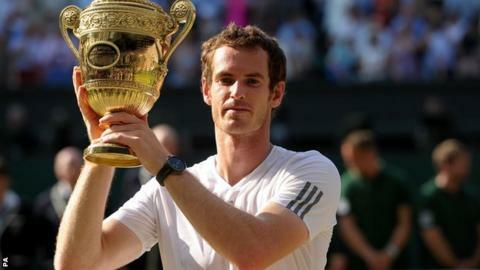 Murray has not won a tournament since his Wimbledon victory last July, with back surgery in September proving to be the biggest interruption in his career to date. The Scot is buoyed by an impressive record on grass, and especially at the All England Club, where he has reached the final for the last two years and the semi-finals for the last five. "If you've done it once, there is no reason you can't do it again," he said. "Each year I've played at Wimbledon, I've got better. It's been slow but steady progress. "Obviously it's going to be tough to top winning the tournament but, if I can play like I did last year, I'll definitely be in with a chance." Goffin, 23, is ranked 104 in the world and has won just two matches at Wimbledon, with his best Grand Slam effort a fourth-round place at the French Open in 2012. If Murray is a heavy favourite to progress, the other six Britons in action on Monday are all outsiders in terms of rankings. Johanna Konta is the only one to make it into the draw without requiring a wildcard and she faces Shuai Peng, the world number 60 from China, while Naomi Broady takes on Hungary's Timea Babos, ranked 94. British number two Dan Evans will have high hopes against Andrey Kuznetsov, ranked 30 places above him at 114, while James Ward faces a tough task against another Russian, 17th seed Mikhail Youzhny. Kyle Edmund, 19, takes on Austria's world number 96, Andreas Haider-Maurer, and Dan Cox faces Frenchman Jeremy Chardy, ranked 43. British number one Heather Watson, fresh from her run to the semi-finals in Eastbourne, gets her campaign under way against Ajla Tomljanovic on Tuesday. Should we expect Murray to retain his title? Read more on Wimbledon 2014: Should we expect Andy Murray to retain title?